Proper, thought through, mobile web design to work for your business. In an ever changing world your web designers need to respond to the needs of the market. 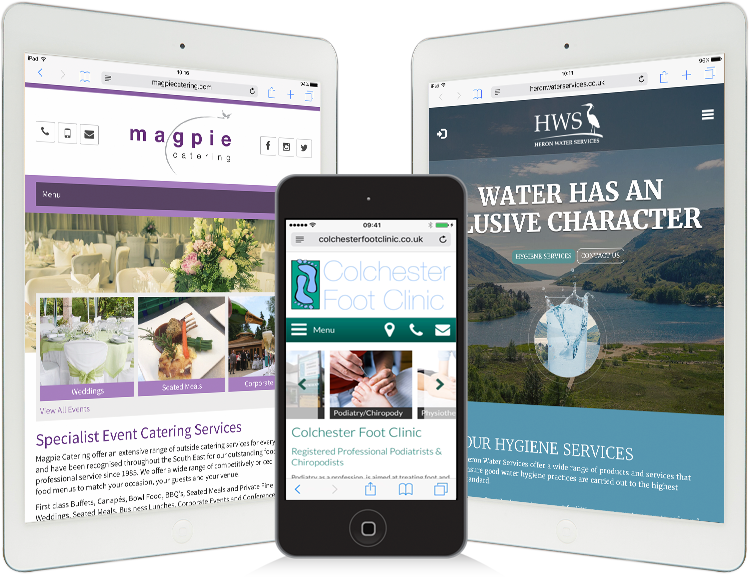 Our experienced team of Colchester based web designers provide the very best in responsive web design for all devices and browsers ensuring the right information is available quickly and easily for your users. Where websites used to ‘just work’ on a tablet or mobile device, now they MUST follow correct guidelines to allow your website to rank well with Google and more importantly be accessible for your customers. It’s essential your website works well on all screens, wherever they are. We don’t just optimise your website, we design clearly structured responsive websites, enhanced to bring clients to you. It’s a fact that mobile optimised websites will appear above non-optimised websites in the Google rankings. If you have a website, it needs to be found. Use all the tools to make sure it reaches Google page one. Don't miss out on business - contact us for more details today.